This is the privacy notice of JPM Plant Hire Ltd. In this document, “we”, “our”, or “us” refer to JPM Plant Hire Ltd. This is a notice to inform you of our policy about all information that we record about you and your company. It sets out the conditions under which we may process any information that we collect from you and your company or that you provide to us. It covers information that could identify your company (“personal information”) and information that could not. In the context of the law and this notice, “process” means collect, store, transfer, use or otherwise act on information. When you enquire about a service from us, or otherwise agree to our terms and conditions, a contract is formed between you and us. Additionally, we may aggregate this information in a general way and use it to provide class information, for example to monitor our performance with respect to a service we provide. If we use it for this purpose, you as an individual will not be personally identifiable. We shall continue to process this information until the contract between us ends or is terminated by either party under the terms of the contract. You may withdraw your consent at any time by instructing us at gdpr@jpmplanthire.co.uk However, if you do so, you may not be able to use our website or our services further. 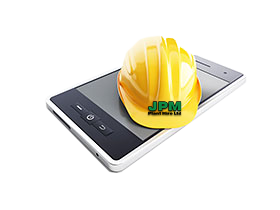 JPM Plant Hire Ltd holds and stores in hard as well as electronic formats on site and are backed up in the United Kingdom. The data held has been obtained in a business to business purpose capacity. The personal data we hold includes names, emails addresses and phone numbers. None of this data is sold and is only shared to complete contracts. Our website is a publishing medium for information about our company and the services that we provide. Any one person can make an enquiry regarding services and plant hire on our website. We never hold credit card details on our systems for payment purposes. If we take payments over the telephone, we never write down or store credit card details. When you agree to set up a direct debit arrangement, the information you give to us is passed to our own bank Barclays Bank PLC for processing according to our instructions. We do not keep a copy. We are registered under the direct debit guarantee scheme. This provides for the customer’s bank to refund disputed payments without question, pending further investigation. Direct debits can only be set up for payments to beneficiaries that are approved originators of direct debits. To be approved, these beneficiaries are subjected to careful vetting procedures. Once approved, they are required to give indemnity guarantees through their banks. If we employ you, we collect information about you and your work from time to time throughout the period of your employment. This information will be used only for purposes directly relevant to your employment. After your employment has ended, we will keep your file for six years] before destroying or deleting it.